This Riesling represents so much that is great about northern Michigan, it is vibrantly alive, fresh, and highlighted with a balanced sweetness. It is surely one that will be a classic in your cellar. Aromas of fresh fruit followed by concentrated flavors of apples, apricots and peaches complemented by honey undertones. Delicious now and with proper cellaring will reward the patient in five plus years. Grilled spicy chicken kabobs, pear and blue cheese spinach salad, roasted duck and peach cobbler. Other suggestions include spicy ethnic cuisine, traditional German foods and Asian fusion. 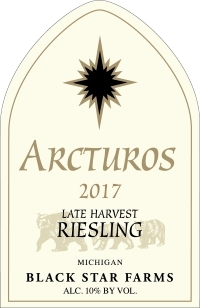 This sweeter Riesling is the result of numerous vineyards providing high quality fruit from the 2017 vintage. It is lush with fresh fruit and balanced with bright acidity. Expect this wine to be delicious now and age well into the next decade. From Hollalujah of Highland, Michigan on 11/9/2018 . From Anonymous of Hartland, Michigan on 8/31/2018 . My #1 favorite. I prefer it over many higher priced varieties. Love this wine! Brings back some wonderful memories too. From Anonymous of Traverse City, Michigan on 8/19/2017 . Black Star does not disappoint in this sweet wine. Arcturus has become my new favorite thanks to BLUE GOAT shop. From Ashley rodriguez of flint, Michigan on 7/17/2017 . This is one of my favorites! My husband and I buy it every year when we come to town.